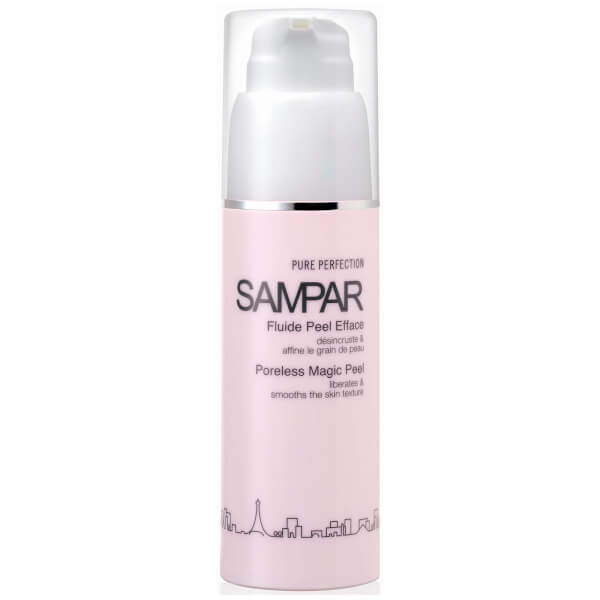 Witness a smooth and refined complexion with SAMPAR Poreless Magic Peel, a skin-refining solution that gently exfoliates skin to promote a smoother, softer and radiant complexion. Infused with Glycolic Acid and restorative enzymes, the fluid delicately sloughs away dead skin cells via chemical exfoliation, and refines the skin's surface whilst improving its natural, self-repairing abilities. Softening and mattifying, it contains extract of Lentil to help regulate sebum production and minimise the appearance of pores, whilst an Urban Advance Complex (comprising Shea Butter Serum, Mint Endorphin and Probiotic Sugar) provides an antioxidant shield, strengthening the skin's natural defences for maximum protection. Performing a deep clean, its anti-bacterial and anti-inflammatory properties promote decongestion, visibly reducing marks and redness for a healthier-looking, more even toned canvas. Apply in the morning to cleansed skin. 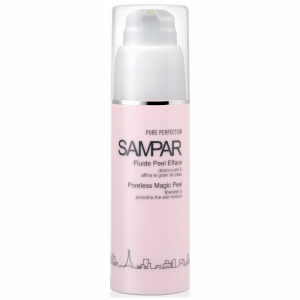 Gently massage the product from the middle of the face to the outside until fully absorbed. Aqua (Water), Glycerin, Pentaerythrityl Distearate, Trilinolein, Phenoxyethanol, Butyrospermum Parkii (Shea Butter), Cetyl Alcoholn Hydrogenated Coconut Oil, Isopropyl Palmitate, Paraffinum Liquidum, Peg-2 Stearate, Stearyl Alcohol, Propylene Glycol, Hydroxyethyl Acrylate/Sodium Acryloyldimethyl Taurate Copolymer, Parfum (Fragrance), Taraktogenos Kurzii Seed oil Cyclodextrin, Triolein, Tripalmitin, Ceteareth-25, Polyquaternium-39, Chlorphenesin, Glycolic Acid, Lens Esculenta (Lentil) Fruit Extract, Trilinolenin, Melaleuca Alternifolia (Tea Tree) Leaf Oil, Tetrasodium EDTA, Sodium Stearate, Nigella Sativa Seed Oil, Leptospermum Scoparium Branch/Leaf Oil, Butylene Glycol, Potassium Lauroyl Wheat Amino Acids, Palm Glycerides, Capryloyl Glycine, Bacillus Ferment, Tristearin, Lactitol, Xylitol, Limonene, Sorbitan Isostearate, Polysorbate-60, Citral, Linalool, Pentylene Glycol, Triarachidin, Magnolia Grandiflora Leaf Extract, Mentha Piperita (Peppermint) Extract, Ethylhexylglycerin, Butyrospermum Parkii (Shea Butter) Seedcake Extract, BHT, Methyllchloroisothiazolinone, Methylisothiazolinone.